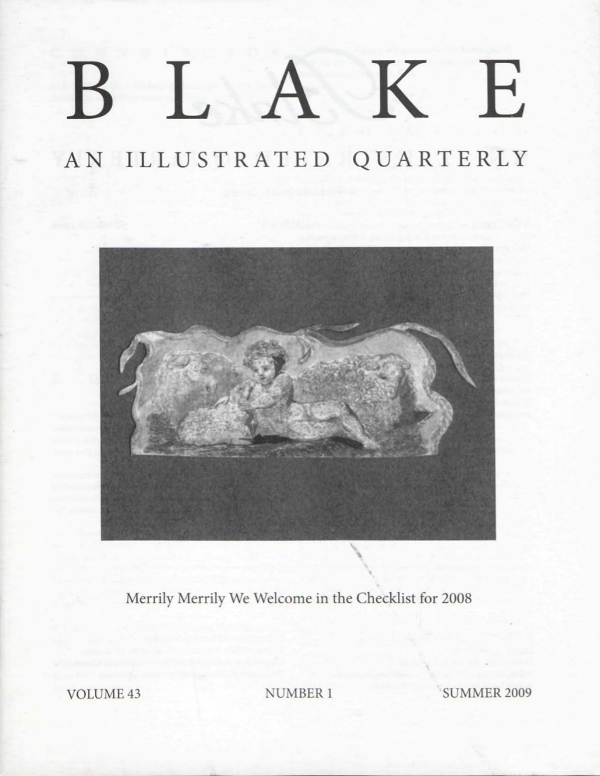 G. E. Bentley, Jr., is working on Blake’s patrons and on the cumulation of “William Blake and His Circle,” 1992-. Cover: The second plate of “Spring” (Songs of Innocence pl. 23), color printed (like pl. 22, now at Yale), lightly water colored by Blake, with features and shadows picked out in black ink, cut down to the design at the bottom (removing the text) so that the outline is irregular, following the contours of the embracing vine. Only one other color-printed leaf from Songs of Innocence is known, pl. 5 (“The Shepherd”), once sold with this copy of “Spring” and now in the Yale Center for British Art <BBS p. 130>. The coloring of this copy of “Spring” is carefully adapted to the shape of the vignette, and I think it likely that the leaf was cut down by Blake himself, perhaps rescuing the design from some defect at the top of the leaf or in the accompanying print for “Spring” (pl. 22)—or simply as an experiment. Pl. 23 was acquired in October 2008 by the library of Victoria University in the University of Toronto.